Regular readers of this blog are encouraged to do some extra reading this week at The Daily Beast. The influential online news site has run a substantial piece I wrote about the apparent vendetta that has kept Richard J. Wershe in prison for all of his adult life for helping the FBI bust corrupt cops in Detroit. In addition, this week’s post focuses on what a real drug kingpin had to say about Rick Wershe. Anyone interested in reading an overview of the Rick Wershe saga is encouraged to visit The Daily Beast and check out the story I wrote for them. Is Cocaine Legend White Boy Rick Serving Life for Busting Crooked Cops? Arthur Dale Derrick was the kind of dope dealer Rick Wershe, Jr. wanted to be. Derrick had a fleet of planes including a personal jet. He had a luxurious suburban home. He stayed in hotel suites and sometimes rented entire floors of a hotel. He had plenty of money. He had connections. Art Derrick was a weight man. That’s drug trade talk for a wholesaler, an importer; the guy the big dope dealers in town turn to for their supply of illegal drugs. When the narcs on the Detroit Organized Crime Drug Enforcement Task Force (OCDETF) suddenly quit talking to Rick Wershe in the summer of 1986 he was a kid adrift. He had worked secretly for the task force for two years, beginning at age 14, as an informant against the Curry Brothers, an east side drug gang with political connections. The Curry organization, led by brothers Johnny and Leo Curry, known as Little Man and Big Man respectively, started in marijuana, moved in to heroin and then in to cocaine when crack swept the big cities of North America in the mid-1980s. Johnny Curry was engaged to Cathy Volsan, the attractive niece of Coleman Young, Detroit’s powerful black mayor. As the mayor’s favorite niece, Cathy Volsan enjoyed personal police protection from the substantial mayoral security detail. The protection included copies of police reports of investigations related to the Currys. Art Derrick was a “weight man”, a wholesale supplier to the Curry Brothers, who also had connects in New York. Dealing crack cocaine was a supply and demand business. Pesky narcs were a constant drag on business. Sometimes they staged raids as part of an investigation. Sometimes they staged raids to steal drugs and cash from the doper dealers so they could sell them to competitors who didn’t care where the stuff came from. Thus, rising drug lords like Johnny and Leo Curry scored their supplies wherever they could. If the supplier was some Cuban in New York, that was fine. If the supplier was a suburban Detroit white guy named Art Derrick, that was fine, too. Rick Wershe, Jr. aspired to be a weight man just like Art Derrick. Wershe had met Derrick during his time as a confidential informant for the FBI. Like many things about the Rick Wershe saga, his estrangement from the federal drug task force agents has multiple versions. Retired FBI agents will tell you Rick Wershe had been key to helping them get court authorization for wiretaps and listening devices focused on the Curry drug operation. After they got the electronic eavesdropping authorization, the federal agents say Wershe became less important. In Rick Wershe’s view, the federal task force narcs dropped him when someone “higher up” got wind they were using a juvenile informant in a highly dangerous drug investigation. In the end, both versions may be true. No one in this saga disputes the point the narcs dropped Rick Wershe without any counseling, without any effort to assimilate this kid from a troubled family back in to a normal teenager’s life. He was a school drop-out because he had been running the streets night after night, living the underworld fast life as a paid informant of the FBI. The only trade he knew was the trade the police taught him; the dope trade. So it came to be that Art Derrick says he took young Rick Wershe under his wing. Wershe disputes how much credit Derrick gets for his brief run as a drug wholesaler wannabe. What follows, is Art Derrick’s version of the Rick Wershe, Jr. story from an affidavit he wrote in 2003. Derrick can’t be questioned about his assertions because he died in 2005, a victim of self-abuse of drugs. The following quotes are from Derrick's sworn affidavit written after Rick Wershe’s one and only parole hearing. Derrick showed up at the parole hearing to testify in Wershe’s behalf, but Patrick McQueeney, Wershe’s attorney at the time, decided it might not be a good idea for a convicted and admitted drug kingpin to testify in support of Wershe. Here's an interesting question to ponder: who better to evaluate the extent of Rick Wershe's dope dealing than another proven (convicted and imprisoned) dope dealer? "I had previously sold cocaine to Mr. Wershe several years ago and in part felt sorry for Mr. Wershe who was arrested when he was a kid and has not been (as) fortunate as myself to be released and get a second chance," Derrick stated in his affidavit. Derrick directly contradicts the testimony of selected law enforcement professionals who had been hand-picked to testify against Wershe at his parole hearing. My own investigation over some 18 months suggests Derrick told the truth and the cops lied. It appears they lied because they had a vendetta against Rick Wershe for helping the FBI nail drug-corrupted cops and Willie Volsan, the drug-dealing brother-in-law of Mayor Young and the father of Cathy Volsan. "In 1985-1987, I was involved in large scale drug trafficking and ultimately met Mr. Wershe. Mr. Wershe was a kid when I met him and was nothing near a sophisticated narcotics trafficker. I referred to Mr. Wershe, as a "wannabe" narcotics trafficker. I was not interested in selling cocaine to a teenager, but I was persuaded to involve Mr. Wershe in drug sales by my partner. I was involved in large scale importation of cocaine and Mr. Wershe was not known in the narcotics industry as a ‘major player.’"
Separately, veteran Detroit criminal defense attorney Steve Fishman has said the same thing. Wershe’s name came up from time to time but he was never a defendant or even a witness in the biggest drug trafficking trials of that era. "I labeled Mr. Wershe, as "White Boy'' Rick, a label that Mr. Wershe never pinned on himself. The reason behind labeling him with such a name was that my partner and I had two (2) Ricks that we were selling drugs to. The first Rick was an African-American, who drove a Maserati and the second Rick was a young white male. In the event that my partner contacted me, he would simply say the "Maz" known as Maserati Rick and Wershe as ‘White Boy’ Rick," Derrick stated. Neither of Derrick's customers named Rick fared too well. Wershe, as we know, is serving a life prison term. 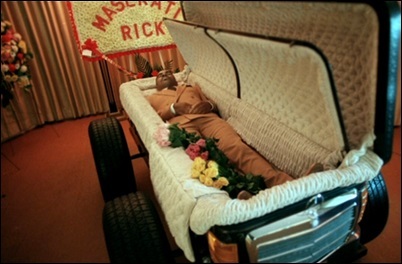 Maserati Rick Carter is dead. He survived an attempted hit only to be murdered in his hospital bed as he was recovering for the botched hit. “The reason I suggest that Mr. Wershe was not a ‘major trafficker’ was the fact that he did not have the ‘toys or items’ that a major trafficker possessed, such as myself. At the time that I was arrested, I owned the most expensive home in the City of Harper Woods (Michigan), a number of Corvettes, four airplanes, a four engine personal jet, several hundred thousand dollars in cash and I can attest that although Mr. Wershe had some money and a couple of automobiles, he did not possess or own the level of assets I had in my possession, because he simply was not a ‘major narcotics trafficker.’"
It’s a question Wershe’s enemies in the Detroit criminal justice establishment have never answered.